[The Addiction Summit]: Day 5 – Are You Genetically Doomed to Be an Addict? Are you genetically doomed to be an addict? How do you recover emotionally? How do you meditate or practice mindfulness? 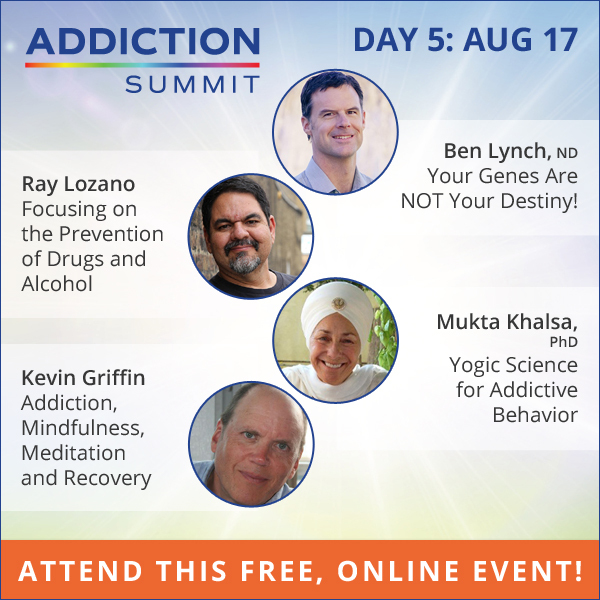 Today at The Addiction Summit, Dr. Ben Lynch proces that “your genes are NOT your destiny.” Ray Lozano will teach you how to talk with children about addiction. Mutka Khalsa and Kevin Griffin discuss their writings and teachings about mindfulness and meditation. Enjoy learning! Affiliates are always welcome to join. We’d love to have you join us as an affiliate partner for these amazing summit events. Affiliates are influential persons who promote these events/community for commissions, like bloggers, speakers and health professionals. Your audience will absolutely love the content and together we’ll be changing the world and you’ll receive cash for your efforts. You help us to help others too. Health Talks Online is your connection to improved health. Help others by spreading the word about these amazing online summit events. Become an affiliate for Health Talks Online.